An insect known as the kissing bug has been casuing concern in tennesse.the bugs feed on the blood of mammals and may carry diseases. Local experts say none have been found in east tennesse just yet, but the bug is has been making its way north and has now been found in Tennessee. The bugs are rare but can be deadly, according to the center for disease control. -Keep your house and any outdoor pet resting areas clean, in addition to periodically checking both areas for the presence of bugs. If you suspect you've found a kissing bug, the CDC says don't squash it. Instead, place it in a container and fill with rubbing alcohol or freeze in water and take to your health department. 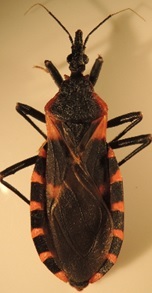 The kissing bug is most likely to hang out under porches, in brush piles, or in outdoor dog houses. These are not to be confused with box elder bugs, which are also red and black and are commonly found indoors this time of year, as they seek a shelter in which to winter.